Summary : Long waits for sub-par pizza at a new food truck serving bar pies around NYC. There are some food items that are intended to be served from trucks. Tacos, cupcakes, and even schnitzel (Schnitzel & Things!) fall into that category. But one thing that shouldn’t be sold from trucks is pizza — or more specifically, personal pizza pies from food trucks in Midtown Manhattan. 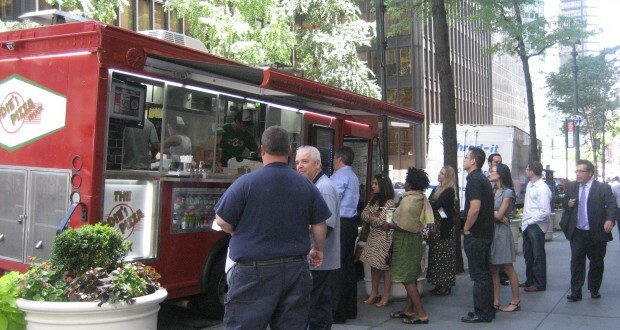 Back in the day, a food truck (or more likely a cart) was typically somewhere you went for a quick bite and a few minutes of fresh air during your lunch break. But slowly New Yorkers have come to accept waiting in line for the opportunity to snag a bite from one of the dozens of mobile food vendors located throughout the city. Eddie’s Pizza Truck, however, takes the notion of patience to a new level. The truck is technically the first outpost of Eddie’s Pizza in New Hyde Park — a renowned establishment that is best known for its thin bar pies. 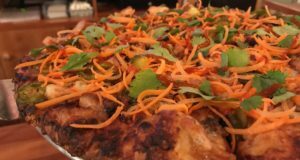 The truck hit the streets of Manhattan in June to much hype (as do most new food trucks these days), but the experience of eating there failed to meet even my low expectations. It’s impossible to write about my Eddie’s Pizza Truck experience without first mentioning the wait. From the time I placed my order until the time my pie was ready: 51 minutes. I went there expecting a wait and placed my order just after 12PM on a Thursday afternoon. There was no line when I approached the truck although there were people hanging out who had already placed their orders. The person who took my order told me that it would take 30 minutes for my pie to come out. When I checked back about 25 minutes later, I was told it would be 12 more minutes, but it ended up taking another 25 minutes. On a positive note, the folks working at the truck couldn’t have been nicer. You could genuinely tell they felt awful about the wait. They treated customers to free ice pops while they waited and gave free drinks to people with their orders. To avoid wait times, the folks at the truck have been encouraging people to call ahead to place their orders. It sounds like a good idea, but in reality doing so is only hurting their business. There didn’t appear to be many people in front of me in line, so it’s safe to assume that the reason my pie took 51 minutes to make was because there was a back log of phone orders they had to fill. Any truck that needs to quote you a wait time when you place your order has a problem. Clearly they are making the maximum numbers of pies they possibly can, but my guess is that customers will be so turned off by the wait that they will find other options for food in the area. In fact, most people left when they were told that there would be a 30 minute wait for a pie. From a business standpoint, turning away customers is bad practice. When my pizza finally came out, it was underwhelming. I ordered a “large” pie for $13.00 to split with a friend, but it was so thin I could have eaten it myself. 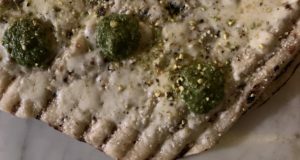 Honestly, it tasted like high quality matzah pizza. Their 10 inch bar pies cost $7.00, but it would take two pies to fill you up. And their $10.00 lunch special – a bar pie (with a topping), a side, and a soda – is a little pricey. I tried out one of their sides – sweet potato gnocchi – but at $4.00 that means I was paying 25 cents for each piece of gnocchi. It tasted fine, but would be more reasonably priced at $2.00. 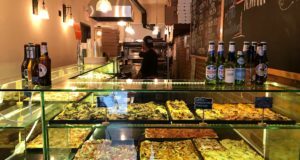 The only way that Eddie’s will be able to maintain customers is if they switch their business model to sell slices rather than custom made personal pies. If they were to charge $1.50 for a slice, they’d still be making $12.00 off of a large pie. They’d be able to better maximize their oven space too. Phone orders should be eliminated. I want Eddie’s Pizza Truck to do well. When any new mobile food vendor opens, there is a lot of curiosity among New Yorkers. But I’m not sure Eddie’s is cultivating repeat customers right now. For me to return, I’d want a guarantee that I wouldn’t have to wait more than five minutes for some pizza. I’m willing to overlook the fact that it didn’t taste so great, for the ability to grab a quick bite during my lunch break.